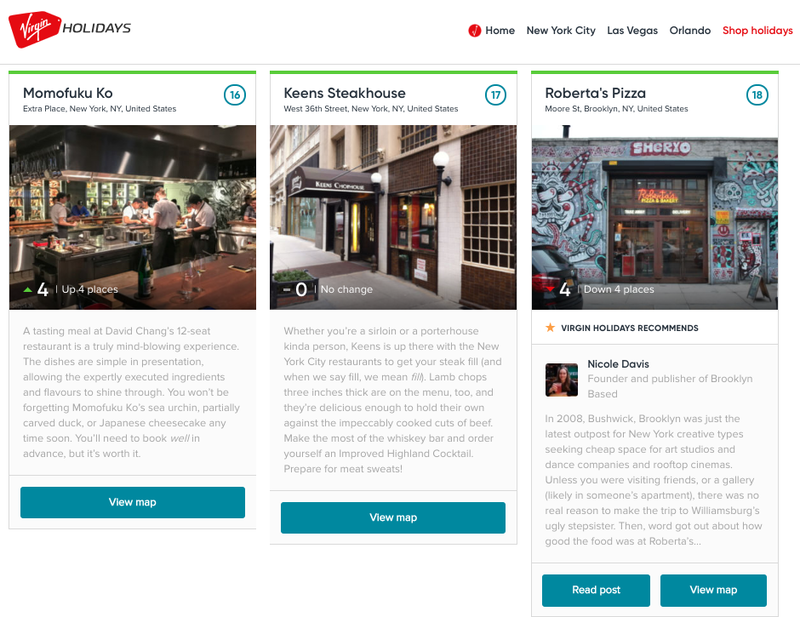 Forward3D, in partnership with our client Virgin Holidays, is delighted to announce the launch of the Trending Travel Guide – the world’s first travel guide curated through the power of social media. With competitors churning out generic keyword-led articles at volume, travel-related SERPs are often saturated with low quality content providing little to no additional value – after all, if your editorial team members have never been to a destination, how can they give an honest opinion on it? Virgin Holidays like to do things differently. Elsewhere, The New York Times says that review sites, such as TripAdvisor, are being unfairly skewed by those posting negative/fake experiences. All this means, from a consumer perspective, that knowing where to look online for travel advice can be as confusing as it is time consuming – hardly the positive experience brands are trying to build. A recent study by Stackla also revealed that 86% of consumers believe authenticity is important when choosing which brands they like. Sixty percent also said content from friends or family influences their purchase decisions, while the same percentage of millennials make travel plans based on social media content. It’s clear that social media is now much more than just hot dog legs on the beach and selfies at Machu Picchu – it is a critical part of a consumer’s research phase. This poses a particularly interesting challenge for brands looking to engage a younger demographic - how can they appear authentic and credible by leveraging consumer opinion, without undermining their authority on the topic? The Trending Travel Guide aims to solve these issues by collating social media post volumes, filtering out negative sentiment, and then using this data to rank attractions according to popularity over the last seven days. This allows social media to curate in a very literal sense, as the order of recommendations is based on millions of opinions. It also allows Virgin Holidays’ expertise to provide insights into why these places rank so highly. Integrating Crimson Hexagon’s API into our proprietary Datasets technology, this list of recommendations updates automatically each day, meaning consumers can use the platform to see what’s trending in their holiday destinations right now and plan their trip accordingly. No more trawling through hashtags. To give additional credibility, we then partnered with some of the most influential travel writers around the world to create exclusive content for the guide and provide Virgin Holiday customers with valuable information not found anywhere else online. For added authenticity, we then interviewed local business owners, museum and art gallery curators, Blue Man Group members, and even a former astronaut, to find out why these destinations are so special and how they’ve grown their digital presence to become social media sensations. With Virgin Holidays and Virgin Atlantic (another Forward3D client) recently launching award-winning brand campaigns, the hope is that the Trending Travel Guide will provide valuable insights into user experience and help support the wider business goals, as well as Forward3D’s cross-channel digital strategy in the future.